Hello world! 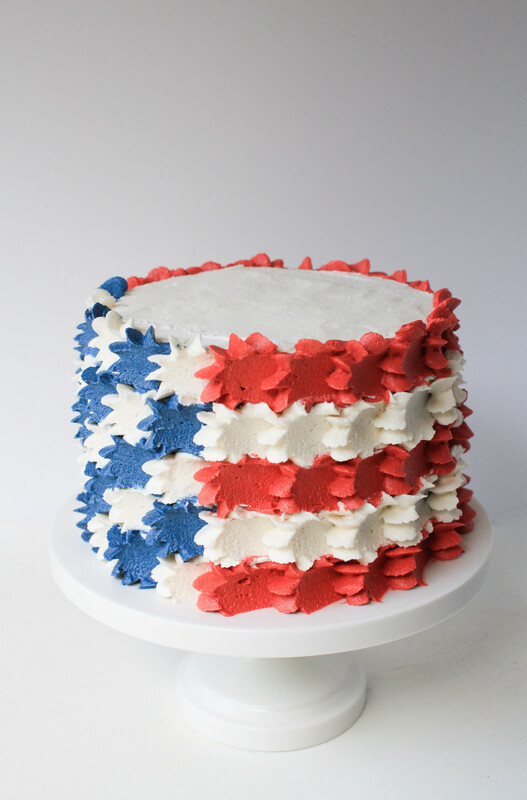 Hello 4th of July cake! Long time no bake. We’re going on week 7 of being a family of four. It’s been very tiring, tricky at times, but lots of fun. I do believe (knock on wood) that we’ve turned a tiny corner and are starting to see some semblance of a schedule developing. I’ve probably spoken way too soon, but I’m hopeful. Limited time and bleary eyes have me approaching holidays this year with simplicity in mind. 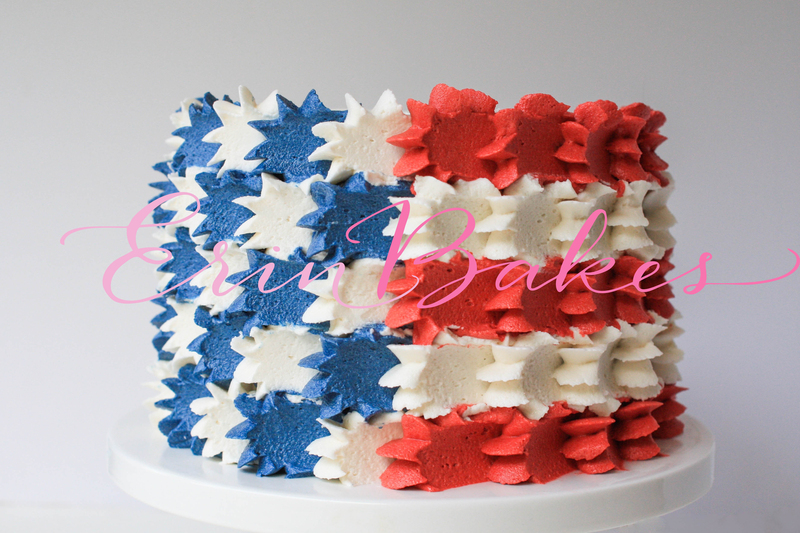 Typically a Swiss meringue girl, I decided to use good old American buttercream for this cake. I’m working one-handed most of the time these days, so a cooked buttercream was kind of out of the question. Dump and go, let the mixer do the work. This recipe from Cake Spy Jesse Oleson did the trick. 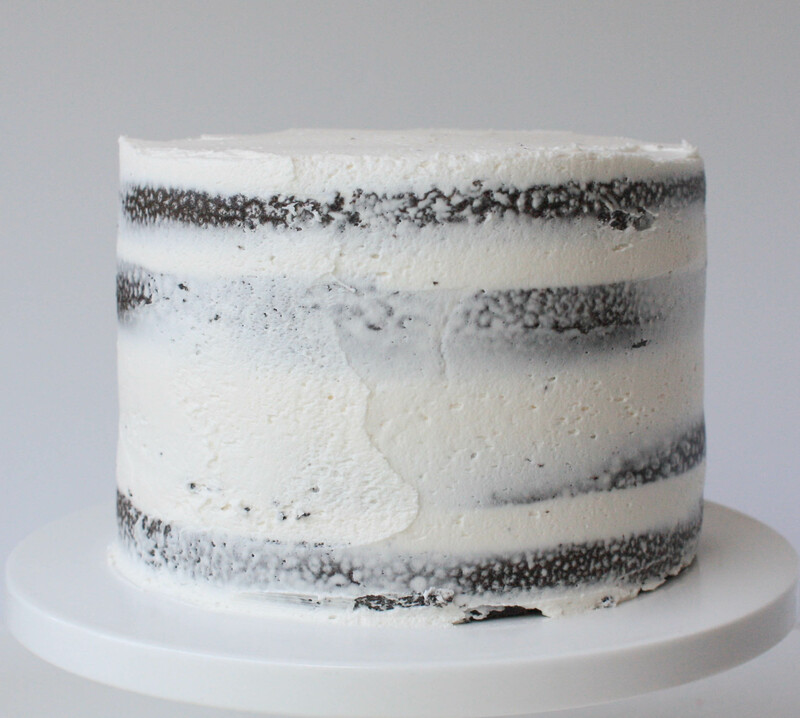 Just enough to fill and create this effect on a four layer 6-inch round cake. 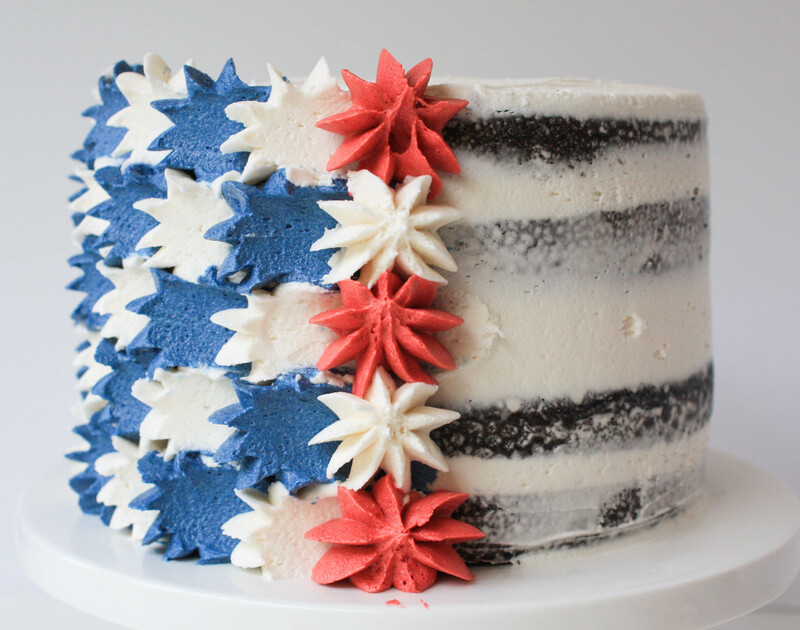 I ended up really liking an American buttercream for this project because it held the star shape nicely and will likely hold up better outside in the heat, as opposed to a meringue based buttercream. It was also very easy to color. I used Americolor super red and navy, with a teeny tiny drop of black in each to help deepen the colors. For my 6-inch round I needed about 1 cup of blue buttercream and 1 1/2 cups of red buttercream. If AMBC isn’t your jam, the technique works just as well with Swiss or Italian meringue. Oh, and the tip is key here! I just so happened to have 3 of them in my tool kit (because I’m crazy like that), but you could use a bag with a coupler and swap out colors as needed. One tip is doable. Two tips makes things move much quicker. 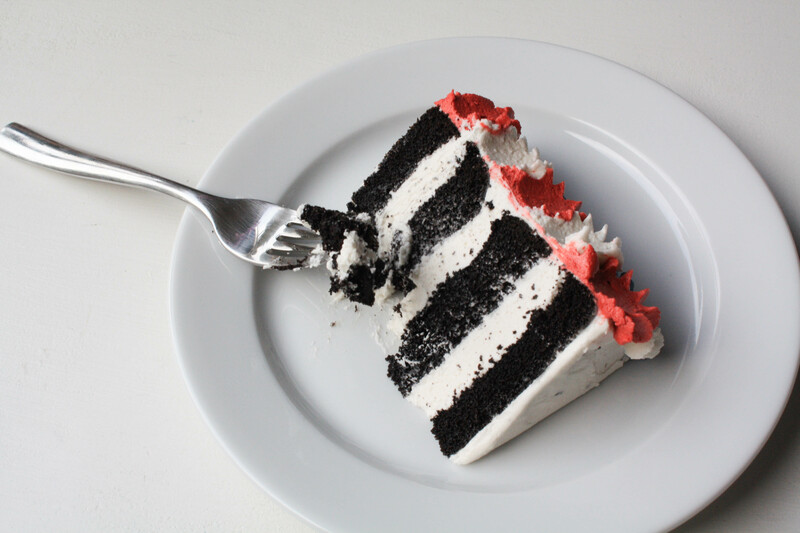 The cake is my black velvet cake. A former staple at my bakery and a family fav. I’ll be sharing the recipe soon enough. In the meantime, use whatever floats your boat. 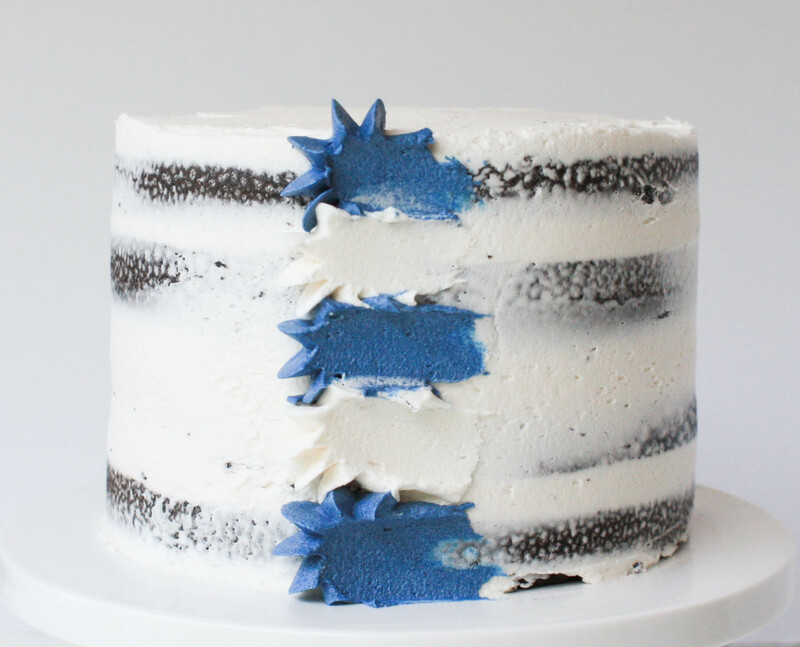 This post is more about the decorating technique. Pipe a row of stars, alternating blue and white. 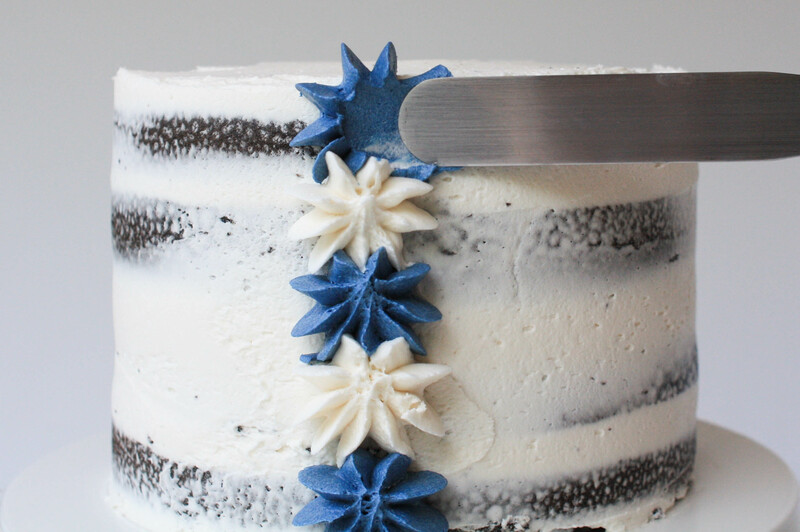 Use the small icing spatula to gently smear each star horizontally across the surface of the cake. Pipe another row of stars over the smeared ends of the first row. This time alternate the blue and white opposite of what you did in the first row. Use the icing spatula to smear this row, same as the first. I repeated this process 4 more times, for a total of 6 blue and white rows. Do more or less depending on the size of your cake. I’m working on a 6-inch round cake. Pipe a row of red and white stars over the smeared ends of the last row of blue and white. Pipe the white stars in this row so that they’re next to the blue stars from the last row. 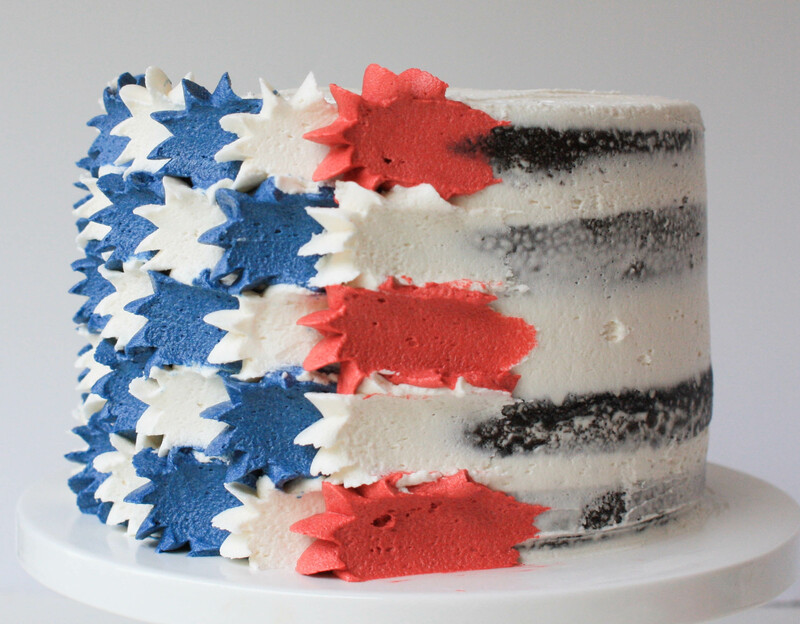 Use the icing spatula to smear the red and white stars same as you did with the blue and white rows. 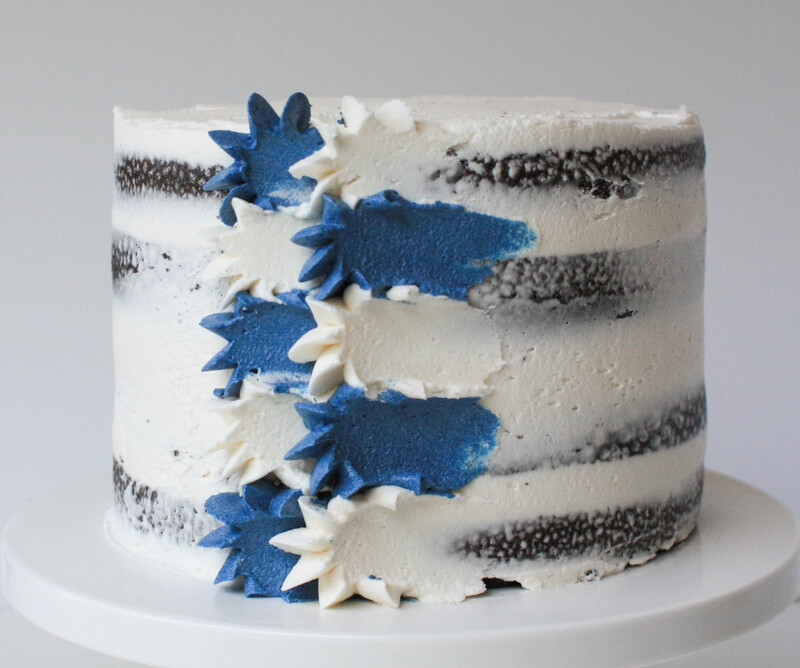 Repeat this process until the entire cake is covered. Leave the last row of stars un-smeared. 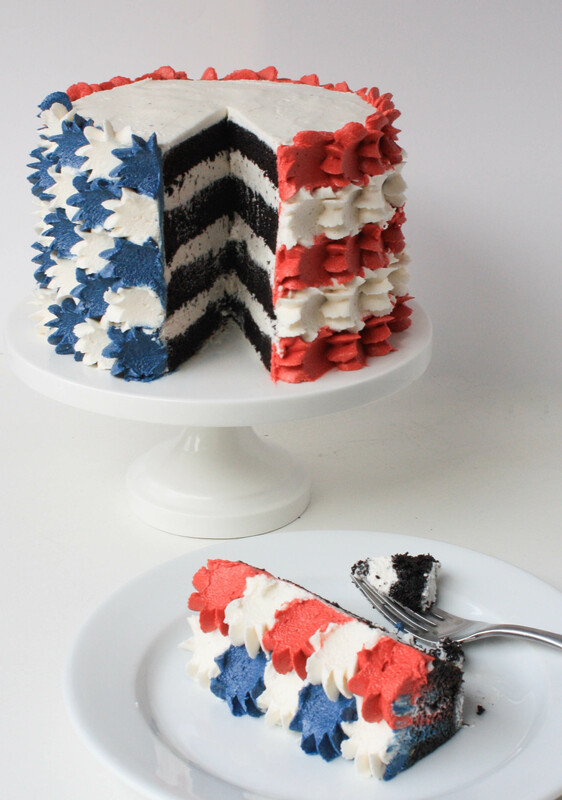 I plan on whipping up this little treat for my family on Independence Day. Send me pics if you end up doing the same! I really just love how this cake came out. So simple, but so effective. 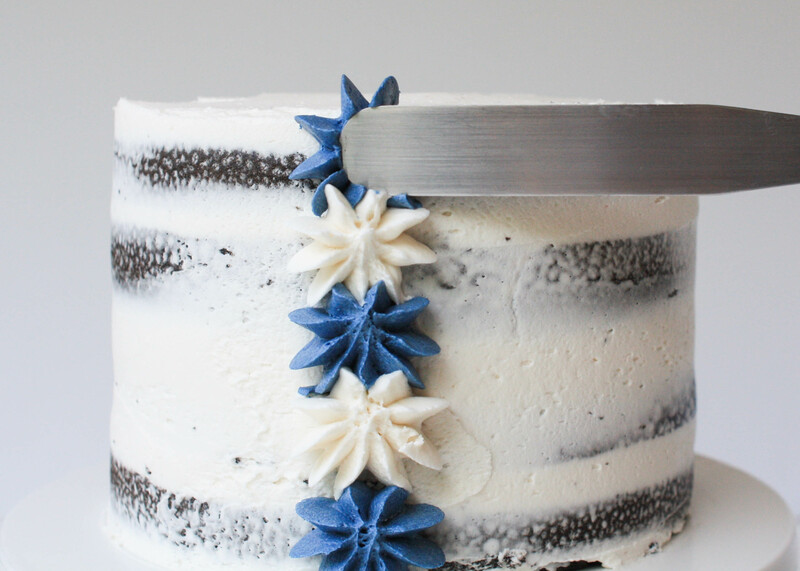 Fiddling around more with buttercream is definitely on my summer to-do list. i love this technique! I’m definitely going to be using it this 4th of July! Thanks for sharing! Gorgeous cake. I want to try this. I can’t find the tip you used. Can I use a 1m or 2 d to get the same effect? Love it. Thanks for posting the great tutorial. Happy 4th! This is such a cute decorating idea! I love that you used a star tip, it looks so creative. Hi there! 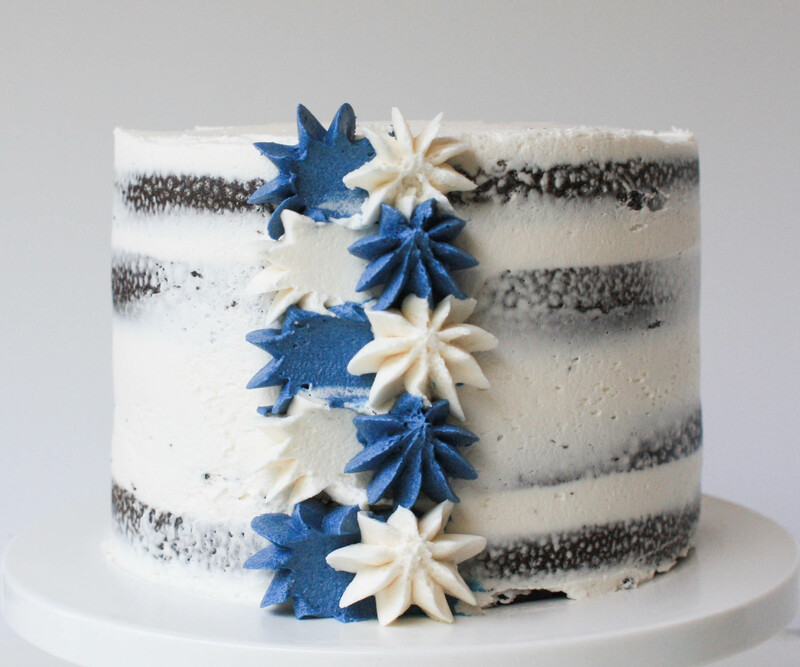 I was surfing the net yesterday for red whit and blue cake ideas that were simple, yet beautiful and your cake was exactly what I was looking for. 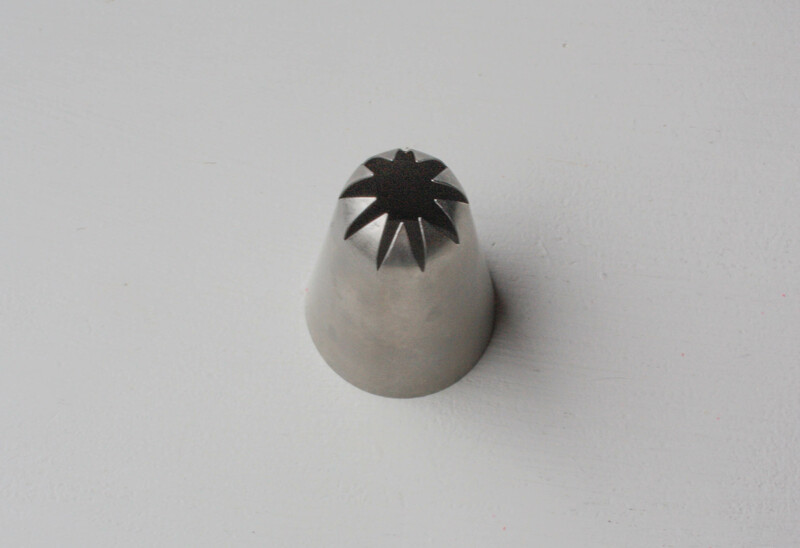 I’ve made many cakes like this using a round tip but never thought of using a star tip. Such a small change made such a big difference in how the cake looks! Thank you for the Idea! 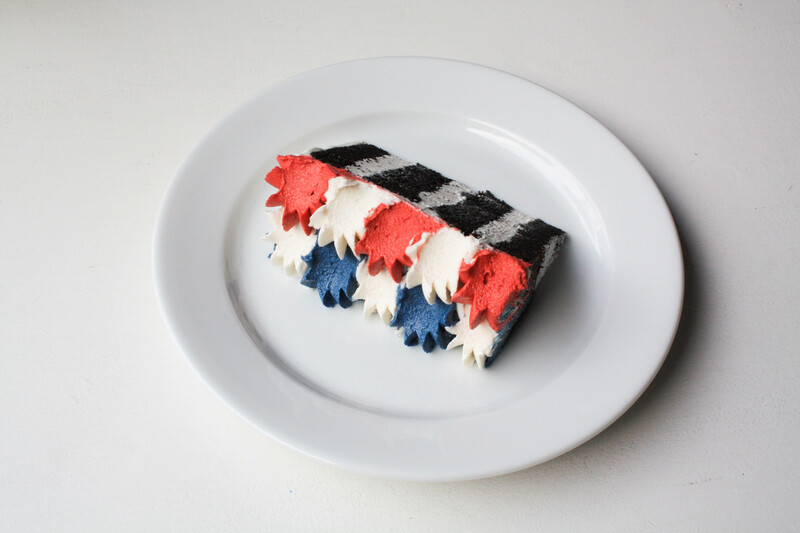 Do you have a picture of the cake where your final column of red and white meets your first column of blue and white? Hi! Unfortunately, I didn’t take a picture of the last row. I will update the post to let you all know how I finished it off. I just piped a final row of red and white stars – unsmeared. Thanks! I love this! What a beautiful idea. 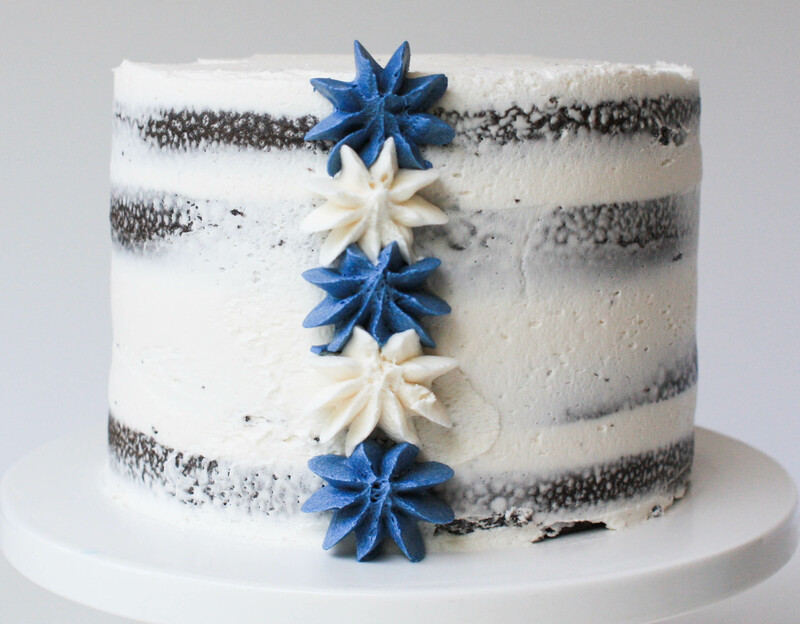 How do you complete and blend in the last column of stars when there is no more blank cake to smear over? I just piped a final row of red and white stars and left them unsmeared. Thanks! I’m new to cake decorating I love this cake. How do you do the very last set of stars? I know how to do the rest but not sure how you finish it. I have seen this technique used and really like it. Could you tell me how the last row is done? Have wondered this every time I see a cake like this. How did you do the last row without messing up the first row? Great question! The last row is just a piped line of stars – unsmeared. Did you make two 6in round cakes for this and cut each in half? Yes! That’s how I make most of my cakes. Do you have a good cake recipe for this? What kind of filling was used?